Easy access to fuel for any industry / commercial establishment / households is essential to conduct their basic operations and daily activities. In the State of Gujarat, Gujarat Gas Limited has developed more than 15,000 KMs of gas pipeline network spread over 19 districts catering Piped Natural Gas to more than 10.27 Lacs Domestic households, 2,778 Small & Medium Industrial units, 11,500 Commercial & Non-Commercial Setups and CNG to the transport segment through its more than 235 CNG stations. 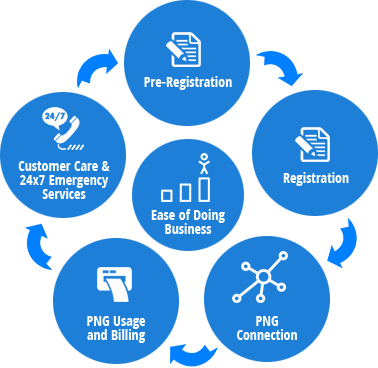 Gujarat Gas Limited has simplified the process of getting PNG connection by putting all information about Piped Natural Gas (PNG) availability, Registration & Connection process, Bill payment options and Customer care services on its website.